iEval provides evaluation services from program development to implementation to conclusion. Evaluation services are tailored to meet the specific needs of each client. iEval is able to provide a range of services to clients. Since each client is different, we work collaboratively with you to determine which services would be most useful to you. Please download our printer-friendly flyers about educational evaluation and general evaluation services. During the program conceptualization, iEval will work with you to integrate evaluative components throughout your program and ensure that program outcomes are specific, measurable, and realistic. 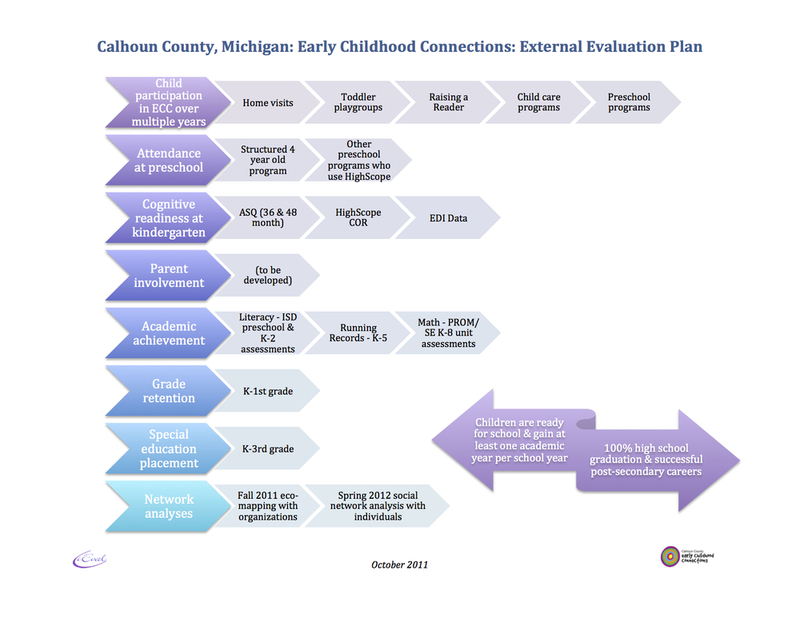 Based on program outcomes, an evaluation plan is developed that includes both internal and external evaluation components. iEval will work with you in the writing of the evaluation section of your grant application, while adhering to the RFP requirements and meeting your organization’s needs. A logic model is a visual depiction of the theory of change for your program starting with the resources your program has, incorporating the necessary activities, identifying outputs to be collected, ascertaining measurable outcomes, and determining long-term impact. The logic model can be used in strategic planning, program development, and evaluation implementation. Program implementation should be based on the logic model, and the evaluation plan is built from the logic model. iEval will help you develop your logic model as part of your grant writing efforts or as the initial step in the creation/implementation of an evaluation plan. An eco-map is a visual depiction of all of the organizations involved in a program/project, and social network analysis looks more indepth at communication and relationships at the individual level. iEval will help create an eco-map or social network map, focus your collaborative efforts where they are most necessary and will achieve maximum benefits, and evaluate progress towards improving your relationships and communication. iEval creates tools to collect quantitative and qualitative data. Quantitative tools may include pre/post tests and surveys. Qualitative tools may include surveys, interviews, focus groups, eco-maps, and program or personnel observations. These tools are developed based on current respected research in the program area, utilizing methods to ensure valid and reliable data. iEval will create and/or research tools that will accurately and efficiently collect data to be analyzed for your program. Data are often triangulated (i.e., multiple data sources are used) to prove the validity of findings. For example, multiple forms of student data can include academic achievement, disciplinary reports, program attendance, teacher comments, etc., and all data sources can be triangulated to help with program improvement, predict future performance, and determine the value of the program. 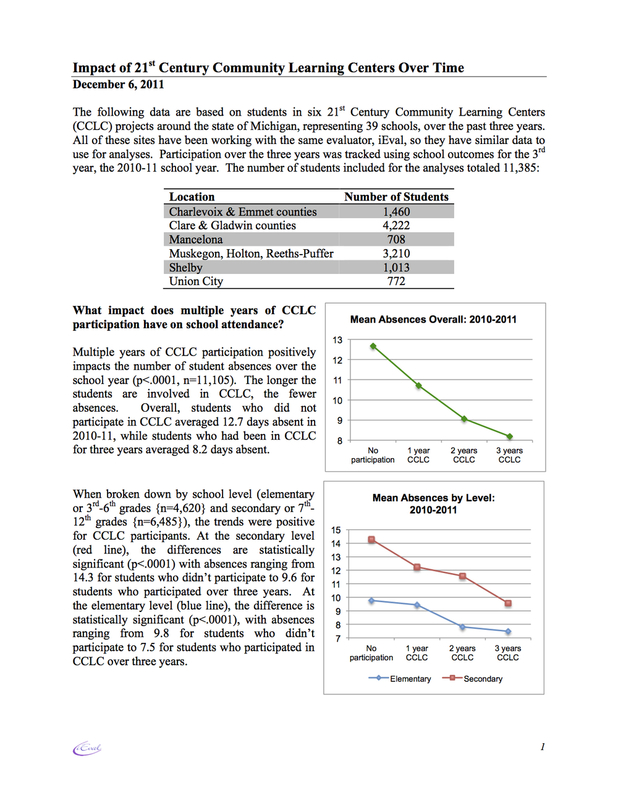 Once the data have been analyzed, interim reports are used to help with program improvement and final reports are used to evaluate the progress made towards achieving program outcomes. Reports are user-friendly and presented in multiple formats to ensure easy access and use by the client. iEval will analyze qualitative data using a thematic approach or quantitative data using various statistical procedures. Training can also be fun! Strategic planning involves a series of team meetings or a staff retreat in order to help your organization/program develop long-term outcomes. iEval will facilitate the planning and develop a plan focused on how to achieve those outcomes. iEval can also help meet your training needs in many evaluation areas including evaluation planning and design, grant writing, logic models, data analysis, action plans, and data use. iEval personalizes the training to meet the client's needs. Training may be integrated into a more comprehensive evaluation plan with iEval or can be contracted on an individual basis. Training opportunities can also range from several hours to several days, depending on the content and audience.